When we started to put together our L.A. City Guide a few months ago, we didn’t realize how difficult it would be to narrow down our favorite places into a list of categories. And when it came time to choose a handful of our favorite coffee shops to share with you, picking only four of our top favorites was impossible. So, we made ourselves a note to feature a longer list of California coffee shops on the blog in the near future. And today, we’re doing just that. The Vibe: This Hancock Park coffee shop is a great place to come if you want to get work done. It’s black and white décor feels like you’re in modern art gallery. The environment might seem a little intimidating if you like cozy coffee houses, but it’s great for a few hours of productivity. Wi-Fi: First two hours free with purchase. The Vibe: Although small, Coffee Commissary is a favorite neighborhood spot in the Fairfax area. Outside is a patio perfect for sipping al fresco, and inside is an industrialist space perfect for plugging in and getting down to work. The Vibe: Located in the mid-city Larchmont area of town, Bricks & Scones is the perfect cozy spot for a studious coed or someone who works from home. Stay on the dimly lit first floor if you’re coming to catch up with friends, and go to the brighter second floor if you’re coming to work. And be sure to order a homemade blueberry scone, warmed up. The Vibe: This Mid City coffee joint is rustic with great coffee and tea. You will find a lot of people who work from home on their laptops in the upstairs loft section of the shop. Downstairs, a few tables have “no laptop” signs displayed, encouraging a friendly atmosphere where you can have a good old fashion face-to-face meeting. Overall, this place has a very productive vibe. One of the coolest parts? Through an inside window you can see the back of the building transform into a dance studio when evening rolls around. Wi-Fi: Free, but no Wi-Fi on weekends. The Vibe: Of its several locations, this Groundworks on Montana Avenue is one of the most recently opened. Nestled on a Santa Monica street filled with restaurants and boutiques, this café boasts a great almond milk latte. With indoor and outdoor seating, this is a great place to network for business meetings or focus on work. The Vibe: Besides having the cutest mustache coffee cups around, Alfred’s is a great place to work or study if you like fresh air and a cool ambiance. It’s located on Melrose Avenue, which makes parking a little tricky. But once you snag a spot, the tasty Stumptown coffee more than makes up for it. The Vibe: One part coffee house, one part retail store, this Silverlake spot is the perfect place to channel your inner artist. Inside you can browse everything from colorful bowties to seasoned mustard, all while ordering a coffee, a pastry, or lunch. Once you’ve made your purchases inside, find a spot on the sunny outdoor patio where you can work on free Wi-Fi for hours. The Vibe: Although it’s small, Menotti’s serves a darn good cappuccino. The front door is just steps away from the Venice Beach boardwalk, so you’ll find hipsters and surfers frequenting this brew house. While they might not offer their customers Wi-Fi, this spot is a great place to meet up with friends to grab a coffee and take a stroll on the beach on the weekend. Plus, the head barista has world-famous latte art skills (think pandas, teddy bears, and hearts). The Vibe: Dialog Café serves up coffee, food, and a comfortable experience. Nestled at the base of the Hollywood Hills in West Hollywood, this family-run business is located in a happening area, but the atmosphere inside is nothing but friendly and cozy. The food is just as good as the coffee, so order the salted caramel latte and Papa’s Omelet. The Vibe: If you’re looking for a place to work while feeling inspired, Brew/Well’s floor-to-ceiling windows and modern-industrial décor will do the trick. Located in Koreatown, this vibrant space attracts students and worker bees alike. 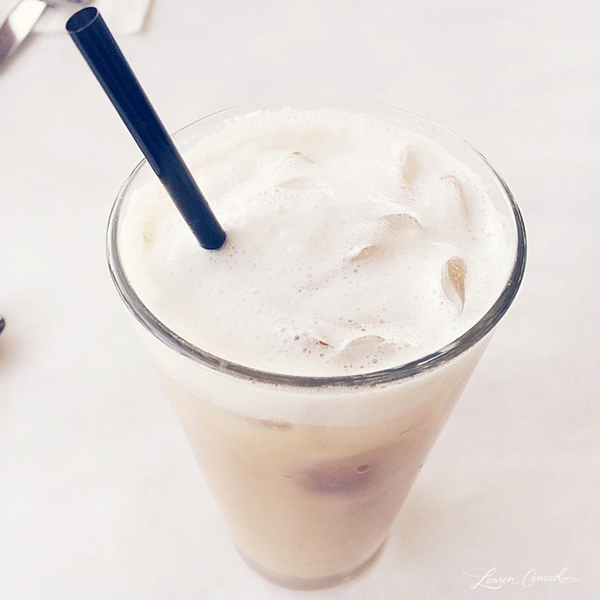 Make sure to order either the cold brew with coconut sugar or the lavender cappuccino. Yum. What are your favorite coffee shops in your city? Are there any you would add to our L.A. list?